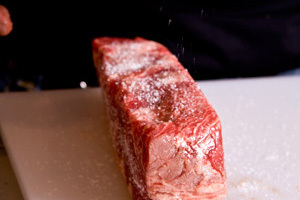 Here are the three ways to prepare steak that are most commonly used in the restaurant industry. They work just as well in the home, and are great ways to cook most steaks. We prefer strip steaks and ribeye steaks for this technique, but any steak will do. 1.Season steak generously with salt & pepper on all sides. 2.Put a sauté pan over medium-high heat. Add grapeseed, peanut or canola oil to coat. 3.When oil begins to smoke, add the steak. 4.Sear on all sides, about 3-5 minutes per side. And, don’t forget the edges. 5.Turn the heat down to medium. 6.Add a couple tablespoons of butter and a couple sprigs of fresh rosemary. 7.Baste every couple minutes. Continue cooking until desired internal temperature. For medium, cook about 8 minutes. 8.Remove from heat and let sit for 5 minutes. 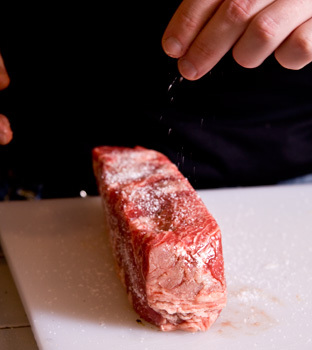 9.Slice and dust with your favorite seasoning salt. To prep, first dry off any surface moisture that could inhibit the development of a nice crust, and then season both sides with salt and pepper. To grill, place on a hot, clean, grill that has been lightly brushed with a cloth dipped in oil. When the first set of grill marks have been achieved, rotate the meat a half-turn in order to develop a restaurant-style hash-mark presentation. Flip halfway through cooking in order to do the same to the other side. Present with the cleaner grill marks up. If you have a thicker steak and are concerned with the outside becoming too dry by the time the inside has reached temperature, searing on the grill and finishing in the oven (see stove/oven instructions below) is a good way to keep this from happening. On the stove, bring an oiled frying pan or cast-iron skillet to high heat and carefully place the steak in the pan with the top half angled away to avoid oil splashes. Sear each side to develop a nice brown crust, then transfer to an oven preheated to around 400 degrees (the same pan can be used). When the steak has reached the desired internal temperature (a probe thermometer inserted into the thickest part is an easy way to tell) remove it from the pan and allow it to rest so the internal juices can be redistributed. Skipping the rest will result in a dryer steak than you were hoping for.